Rumor: Intel Atom N450 (Pine Trail) to launch on January 3rd? Fudzilla is reporting that Intel’s new Atom N450 chipset – codenamed Pine Trail (see previous coverage here) — will officially launch on January 3rd. Previous reports suggested that the chipset will be made available to manufacturers sometime this month, to which I speculated that we’d see Pine Trail-equipped netbooks around the holidays. If Fudzilla’s report is true, though — and the site makes no reference to any sources, so take the information with a grain of salt — then it appears these new netbooks would make an appearance just in time for CES. Whatever the case, the 1.66GHz CPU will apparently sell for around $64, which is $20 more expensive than current N270 package. 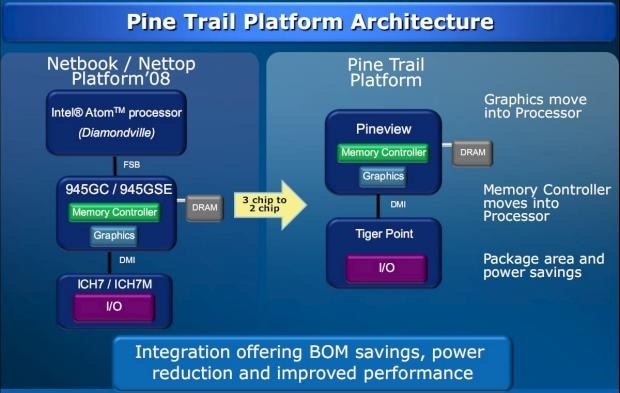 The Pine Trail platform shifts the system from a 3-chip architecture down to a 2-chip architecture in order to save physical space and, theoretically, reduces power consumption and improves performance.